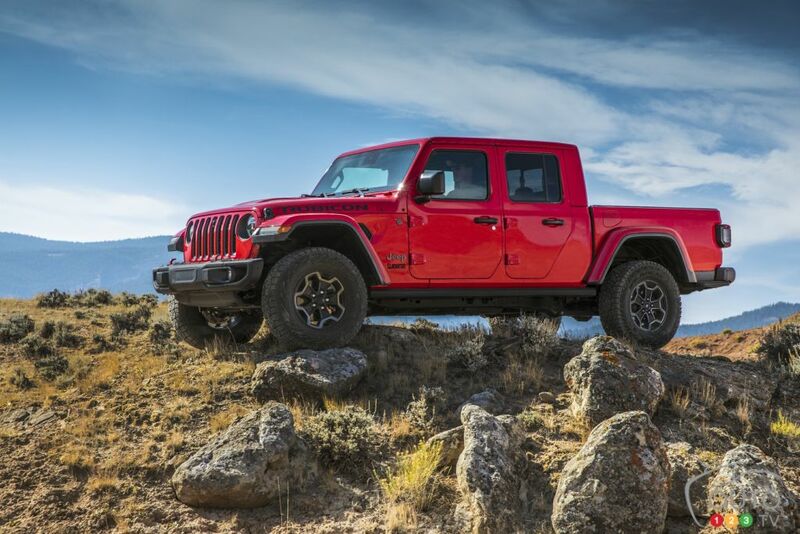 Sacramento, CA - I’m not sure, but the Jeep Gladiator may be the biggest launch of the year. The Wrangler is already a popular and cultish vehicle in itself that has had numerous special editions to its name. At its core, the vehicle hasn’t changed all that much over the years – off road-centric, cool, but not coddling -- so aside from the graphics, colours and wheels that those various special editions brought, what could Jeep do to make it even more special? Well, why not add a pickup bed, right? Right. It’s been done before, the Wrangler-as-pickup thing, with the CJ-8 Scrambler in the early 80s, and various aftermarket companies have made pickup conversions for regular Wranglers. We’ve even seen the Gladiator name used before on a Jeep, in the 1960s-70s. Maybe a factory-built pickup version was just what the doctor ordered. 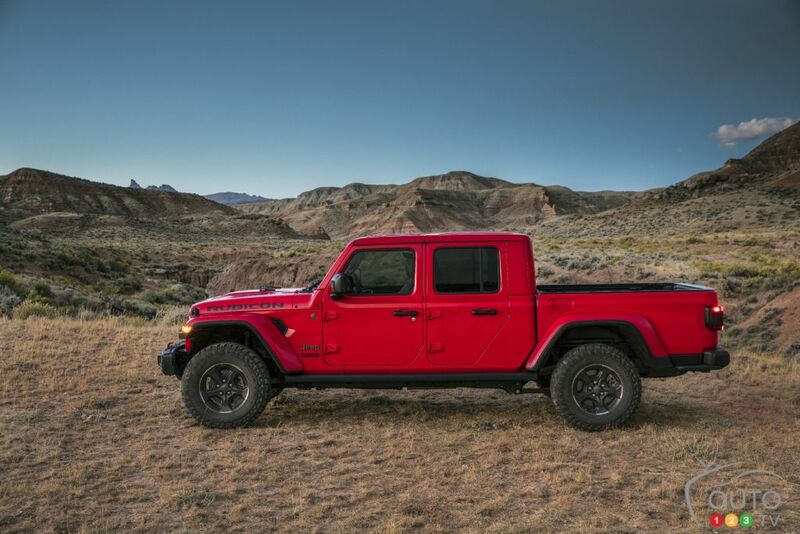 Not only would it add yet another dimension to the Wrangler aura, but it would serve the dual purpose of giving Jeep – and parent company FCA – a way to fill the void in the midsize pickup segment left by the 2011 departure of the Dodge Dakota, even though Jeep says the Gladiator has a more lifestyle-based audience than the Dakota ever did. Most of the competition has introduced mid-size trucks since then, or has started to recently. Of course, a key part of that is it has to look like a Jeep. While from the B-pillars on back it’s different from the traditional Wrangler, forward of that, it’s got all the Wrangler goodies we know and love: the removable doors, big fenders, rounded headlights, removable hard top or folding soft top and 7-slat grille are all present and accounted for. The interior as well is a spitting image, all broad, vertical surfaces with vent roundels, centre stack-mounted window controls and traditional three-spoke steering wheel. The rear seats, meanwhile, can fold flat or flip up stadium- or movie theatre-style, exposing secure storage bins below. Unfortunately, there’s no flat load floor so fitting anything other than a small cooler or tackle box on the floor will pose a bit of a problem. Also missing unless you tick an option box on the top-spec Rubicon trim are heated seats and steering wheel, which is a bit surprising considering the Rubi’s $52,496 base price. The base Sport S model, by the way, starts at $45,495, while the mid-grade Overland comes in at $49,495. Neither of which get the heated seats or steering wheel option, which is a big no-no in Canada. Aft of the B pillar, the Gladiator is 752 mm longer than the Wrangler Unlimited, with a 480 mm longer wheelbase. It also borrows its steel control arms and track bar from its RAM 1500 cousin in order for the rear end to accommodate the loads expected of a pickup. Speaking of which, the Gladiator is capable of carrying up to 760 kg and pulling up to 3,470 kg, which puts it ahead of the Toyota Tacoma, the Chevrolet Colorado and even the anew Ford Ranger. 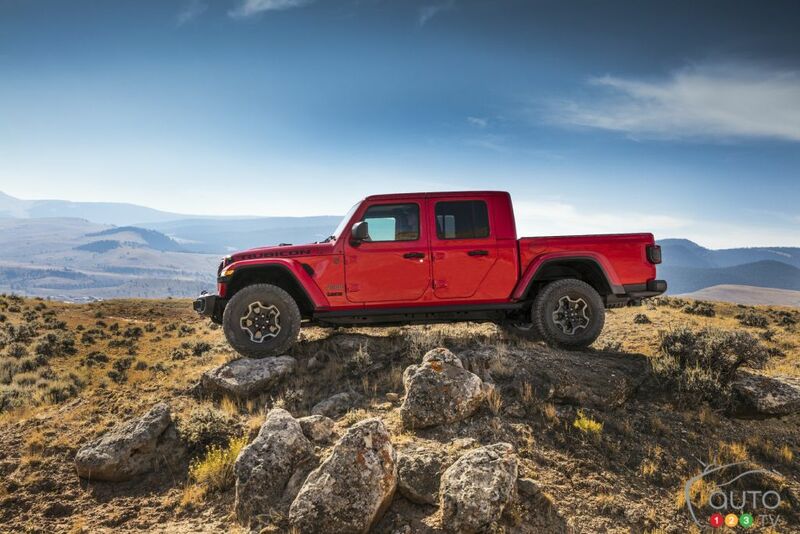 Based on those stats alone, the Gladiator is far more than just a Wrangler in drag. The five-foot bed, meanwhile, gets neat stuff like dirtbike tire-like imprints on its back wall, bed lights and a tailgate that can be locked at 45 degrees so as to more easily accommodate longer items. You can also then balance longer items on top of the wheel wells, leaving room underneath for more storage. It’s a good thing the bed walls are low, though. There’s a quasi-tacky surface on the rear bumper to step on, but that’s about it when it comes to boosting your bed access. The indentation in which the rear marker lights sit looks like it could be a step, but its surface is slippery and you risk damaging the marker lights if you decide to jam a steel-toed Caterpillar boot (or Blundstone boot, considering the young, adventurous buyers this is aimed at) in there. Like the Wrangler, the Gladiator gets Dana 44 axles as well as both Command-Trac and Rick-Trac 4 x 4 system; the former provides a shift-on-the-fly 2.72 rear axle, the latter a 4.1 rear axle ratio and locking front and rear differentials. All Gladiators, meanwhile, are Trail Rated, and that title is more than just a badge: a Jeep with Trail Rated status needs to pass a ton of tests in order to earn the designation. Less obvious from looking at it is how much of the Gladiator’s body is constructed from aluminum. The doors, hood, fenders, windshield frame and tailgate are all constructed from the stuff, helping save weight and allowing for that payload and towing capacity. Power – as you’d expect – comes from a 3.6L Pentastar V6, good for 286 hp and 260 lb-ft of torque; a 260 hp, 442 lb-ft diesel is expected to arrive for the 2020 calendar year. Standard transmission duties, meanwhile, are handled by a 6-speed manual gearbox, with an optional $1,595 8-speed auto. Both the Overland and Rubicon trims we sampled on our test had the latter transmission. It’s not a bad pairing, though, that 8-speed and V6. The Gladiator is quick off the line, the gearshifts smooth and forward progress continues to be brisk as you move through the rev band. Yes, competitors like the Chevrolet Colorado make more power, but even with the Gladiator Overland’s 2,137-kg curb weight, I wouldn’t say that I was left wanting for more power. Some, of course, might be looking ahead with impatience for the torquey diesel powertrain that’s on the way, but I know that I wasn’t clamouring for it during my drive. Maybe a little when I tested that tow capacity by dragging a boat and trailer behind me, but it’s not like the Pentastar-equipped truck felt completely bogged down by the tow. Not to mention that most Gladiator buyers are likely to tow far less weigh than that - a couple of Sea-Doos, perhaps, or maybe a tent trailer. 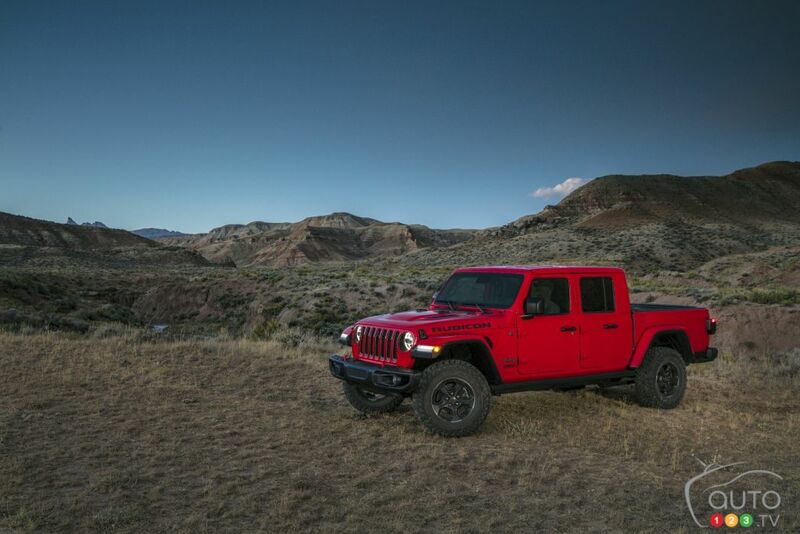 Like the latest-generation Wrangler, Jeep has worked hard at making the Gladiator more livable on the highway, always a sore spot with the Wrangler. And it’s undeniable that the Gladiator drives and rides nothing like the Jeeps of old (if you can call 2017 “old”). The rear end does feel slightly stiffer, though, as that’s what you want when testing the curb weight and I did feel a little bit of axle hop here and there. The more omnipresent feeling, however, was one of solidity and predictability, as each wheel absorbed the cracked tarmac here, a rough shoulder there and so on. Bumps that would have much pricier SUVs hammering their bumpstops are swallowed up with gumption by the Gladiator and spat out the other side like so much mud off an off-road tire. Ahh, off-road. Of course, longer wheelbase or no, if something is going to have words like “Jeep”, “Trail Rated” and “Wrangler” attached to it, it had better be able to not just make the cut in adverse conditions, but make the first line, too. Lucky for us, the NoCal area around Sacramento was more than happy to oblige, dousing us with rain during our visit, just as it had the few days before. We were cut loose on an off-road track during our test, and it was one that had been made all the more hazardous by the conditions. Mud pits everywhere, slick rock and slippery grass were the orders of the day. You have to think the Jeep people on hand couldn’t have been happier. If the Gladiator was going to pass muster here, it was going to do so almost everywhere. And pass muster it did, as the hefty axles articulated beautifully over sharp, slick rock that had us and our Rubicon pitched at 25-degree angles and more, while the locking differentials – adjusted by simply flipping a toggle at the base of the centre stack (up for front and rear lock, down for rear lock) – grappled with the surface below to pull us out of seemingly impossible situations. Indeed, even with that extra length and that extra space between the axles, the Gladiator remains an off-road crusader true to its Wrangler form; I am not an overly experienced off-roader, but this truck here sure made me feel like one (as did the helpful instructors guiding us through the course, with airplane-wand-guy-style hand signals). Tight corners ‘round jagged rockpiles I thought for sure would be shearing my rocker panels were avoided – according to my guide – with plenty of room to spare, and even when I felt like I was sliding sideways when I should have been moving downwards, the Gladiator would save me from peril. I will take some of the credit for that, but not all of it. As I drove back from the sloppy-mud-bath-gnarliness that was the off-road course (listening to Sirius XM Chill on the very good Uconnect infotainment system), I proceeded to put that tow rating to the test by pulling a boat behind me. It gave me the chance to consider what Jeep had managed to achieve with the Gladiator. It could have been pretty easy to muck it up; just slap a pickup bed on there and bob’s your uncle. They haven’t done that, though – at least, they’ve done much more than just that. Turning to the RAM 1500 was a smart move, and they’ve managed to produce a capable, fun and unique vehicle even though it really is a bit of a kaleidoscope of various FCA platforms. I have no problem with that, as long as it can walk that walk. And while I feel that base price might scare some people off, it’s only $2,500 up on the Wrangler at any given trim level. I’m fairly certain there are enough folks that worship the altar of Wrangler to ensure that the Gladiator will sell, and that it will sell in big numbers.